Today's star is all-American icon John Wayne. TCM is celebrating the career of John Wayne with 12 movies on Aug. 19. Here's what you need to know about old Hollywood's greatest Western star. FYI: TCM sometimes changes the air times and /or movies, so you can go to www.tcm.com to check the updated schedule. Born: May 26, 1907, in Winterset, Iowa. Died: June 11, 1979, in Los Angeles. He is buried at Pacific View Memorial Park in Corona del Mar, Calif.
AKA: Director Raoul Walsh didn't think Marion Morrison was an appropriate name for a Western star, so he rechristened the actor Anthony Wayne after the famous Revolutionary War general. The studio executives didn't like Anthony so they changed his first name to John. Academy Awards: Wayne won a best actor Oscar for True Grit (1969). He was nominated for best actor for The Sands of Iwo Jima (1949). Brief bio: Wayne was born in rural Iowa, but his family moved to Glendale, Calif., in 1916 so his pharmacist father could find a better paying job. Wayne was always good at sports, and he earned an athletic scholarship to the University of Southern California where he played football until he injured his collarbone in a surfing accident. As a result, Wayne lost his scholarship and had to quit school. Wayne started out as a prop boy and extra in Tom Mix Westerns, but he eventually worked his way up to speaking parts. He starred in the big-budget Western The Big Trail in 1930, but it was a colossal flop, and Wayne was mired in B Westerns until his old friend, director John Ford, picked him for the plum role of the Ringo Kid in Stagecoach (1939). After the success of Stagecoach, Wayne never looked back. He was one of old Hollywood's top box office stars for four decades until his death in 1979 from cancer. 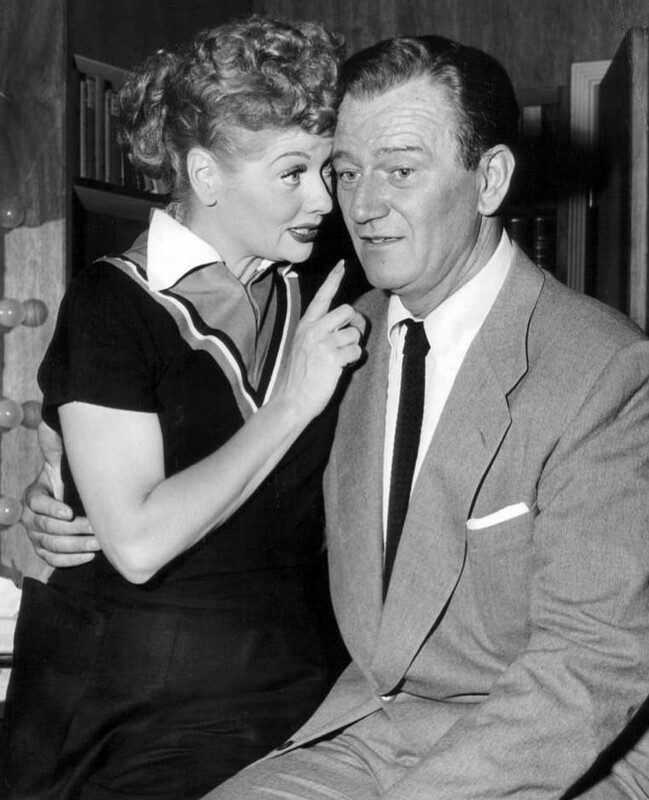 Lucille Ball and John Wayne on the set of I Love Lucy. Fun fact: Wayne got his nickname from his childhood dog, an Airedale terrier named Duke. 1. TCM has a great primetime line-up starting with The Quiet Man (1952) at 8 p.m. This romantic drama directed by Ford is the best screen pairing of frequent co-stars Wayne and Maureen O'Hara, plus it has beautiful location footage from Ireland. 2. 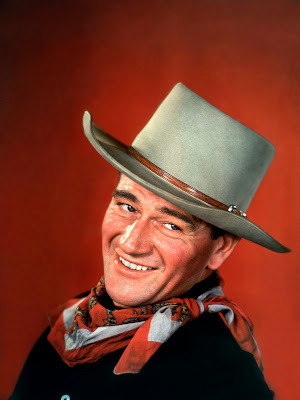 Next up is The Searchers (1956), airing at 10:15 p.m., which many consider both Ford and Wayne's best films. Wayne is unforgettable as Ethan Edwards, an ex-Confederate soldier who goes on a years long quest to find his niece (Natalie Wood), who has been kidnapped by Comanches. 3. Rio Bravo (1959), airing at 12:30 a.m., is simply great escapist fare. This wildly entertaining Western directed by Howard Hawks features Wayne as an honest sheriff who enlists a crooning gunslinger (Ricky Nelson), a drunk (Dean Martin), and an old man (Walter Brennan in full "gull durn it" mode) to battle a ruthless cattle baron (John Russell). A great movie not featured during Summer Under the Stars: Wayne gives a riveting performance as a vengeance-filled cattle baron in Red River (1948), which just started streaming on Amazon Prime. Old Hollywood video: A montage of Wayne's many memorable movie quotes. 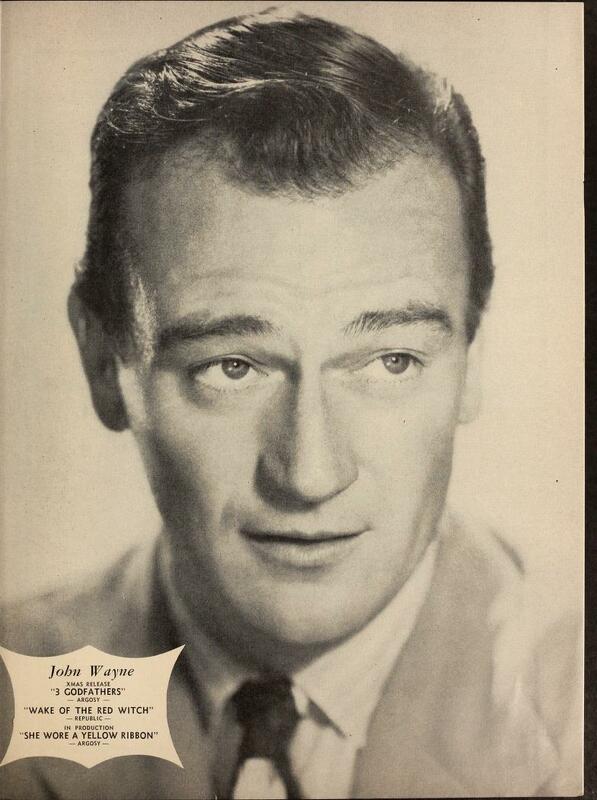 Fan Magazine Flashback: Wayne is named the leading star of 1948 in Showman's Trade Review. Courtesy of the Media History Digital Library. Old Hollywood GIF: Wayne and O'Hara in The Quiet Man. Courtesy of giphy.com. Old Hollywood Archive: The Angel and the Badman, Chisum, and Stagecoach are part of my Top 100 Westerns series. For more Summer Under the Stars articles, go here. There'll be plenty more on Wayne on social media. Follow me on Tumblr, Google+ or Pinterest or like us on Facebook. Follow us on Twitter @oldhollywood21.